I know some of you are probably already sick and tired of the frequency of posts on black Confederates. Well, get use to it. I am in the process of co-writing an article about Silas Chandler and in the beginning stages of what I hope to be a book-length manuscript on the subject. Tomorrow I am finally going to film my segments for a documentary on the subject, which is being produced by a film professor at East Carolina University. As a Civil War enthusiast who is interested in memory I couldn’t be more intrigued by this subject. The most frustrating part of this debate for me is the way the question is all too often framed: Were there black Confederates and, if so, how many? As I’ve said before, if we are talking about soldiers than it is a pretty straightforward process of providing enlistment papers to demonstrate this particular status within the army. Anything else, including pension papers must be seen as inconclusive given what we know about the process. As I see it the number is so small that any account will have to demonstrate how the individual soldier managed to maneuver through the strict enforcement that the Confederate government instituted when it came to the recruitment of free and enslaved blacks. That, of course, will be an interesting story and one that I would love to hear more about. More importantly, the contours of this debate prevents us from honestly exploring the lives of individual free and enslaved blacks during the war. We lump all of them together as “loyal” “devoted” servants, who along with their white comrades “sacrificed” all for the Confederacy. In this we learn next to nothing about the individuals themselves and how they understood the experience of camp life/battle and the time away from loved ones. Consider the number of narratives that include the servant/slave bringing home his wounded master. Just about all of these accounts come from the postwar period, but I’ve never come across an article written by the slave in question, which, of course, is not surprising given the illiteracy rates. We know that Silas Chander escorted Andrew Chandler home after the latter was wounded in battle. In most Online accounts this is reduced to his supposed faithfulness and devotion to Andrew, which fall neatly into the broader postwar slave narrative. Now there is little doubt that servants shared the challenges of camp life and even, on occasion, the dangers of the battlefield with their masters. As historians we must be receptive to the ways in which the war shaped the relationship between slave and master. I have little reason to doubt that certain bonds of affection would have been established as a result, but this cannot be the beginning and end of our analysis of these men. In the case of Silas he had a wife and child back in Palo Alto, Mississippi. But even if Silas did not have a family we should not be surprised that he might choose to bring his master home. After all, he was still legally bound to his owner and may have viewed running away as more of a risk even though thousands of fellow slaves did just that. What I find the most troubling about all of this is the extent to which slaves like Silas and even those who turn out to be legitimate soldiers (however small the number) will be ignored because it turns out that most people are not really interested in recounting their experiences. The approach is to engage in hard-headed reductionism that may satisfy those desperate to vindicate a certain view of the past, but gets us nowhere in terms of understanding these men and the unique challenges they faced as black southerners. Unfortunately, I suspect that in just about all of these cases we will be able to say very little because of a lack of sufficient documentation. Of course, this will not stop the SCV from continuing to butcher this part of the past by placing headstones that distort the distinction between slave and soldier. They did it with Weary Clyburn and in the case of Silas Chandler they placed an “Iron Cross” in front of his marker. This needs to be denounced, not simply as bad history, but as a blatant attempt to use the lives of others as a means to an end. My point is simple. We have got to get over ourselves when confronting the past. I do not claim complete objectivity when doing history nor do I believe anyone achieves such a perspective, but we can help ourselves by asking the right questions and by exercising a healthy dose of skepticism. It occurs to me that, a la Occam’s Razor, a simple answer often serves best. Of course, we have no way of knowing, no documentation for it per se, but it could come down to something as simple as honor. Granted, in a society of honor white folk might be reluctant to extend those notions to enslaved black people but the reason these men might return to their masters is as simple as they had given their word. Slaves brought with them from Africa, if memory of some of my readings holds, their own sense of honor which meshed well with the white Southern sense of honor. I could see or understand that such an argument might be constructed – a slave gave his master his word to look after young master and bring the body home if it came to that. While I take your point that the crucible of the war might form bonds I would suggest that those bonds existed before the war. “My family black and white” had real sentiment behind it for white’s who owned slaves as seen in the sense of betrayal felt or stated when their black family had, by gosh, their own ideas and embraced their freedom. In then, what I would perhaps view as ironic, the very action that masters considered faithful or devoted bespoke of the honor of the slave himself and proved humanity and individualism rather than a mere extension of the master’s will. Far from being an affirmation of the slave society, the act itself speaks of the humanity of the slave and thus is a refutation of the slave society and the Dred Scott decision. More than my two red pennies worth. That’s a really good point, Chris. It also meshes well with the fact that servants were often given instructions by the parents of an officer to watch over him almost as a father figure. That allows us to extend our analysis further beyond simply looking at the basic responsibilities of any servant, which included cleaning and cooking. It also helps us to understand many of the photographs that depict soldier and slave together as in the case of Silas and Andrew Chandler. Of course, all of this must be understood within the broader framework of a relationship that was built on coercion. Thanks for the comment. Kevin-You make excellent points. For me, placing all of it in the context of a society in which a slave or a free black (who, if he/she did not have a white patron, was often at more risk from whites than a slave since someone harming a slave might fear incurring the rather of a planter who did not appreciating some white trash damaging or destroying his property) had to function is essential. An amazing number of slaves did run, but it was difficult and dangerous in peacetime and could be fatal, especially if caught. It’s why experts point to the disproportionate number of young males among the runaways: they could withstand the hardships better and the women often had young children who could not safely make the journey. 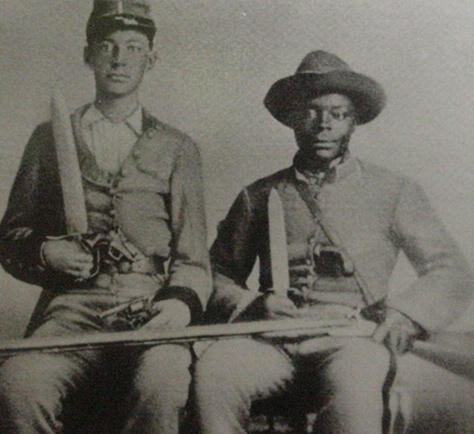 Previous post: Why Are Whites So Interested in Black Confederates?